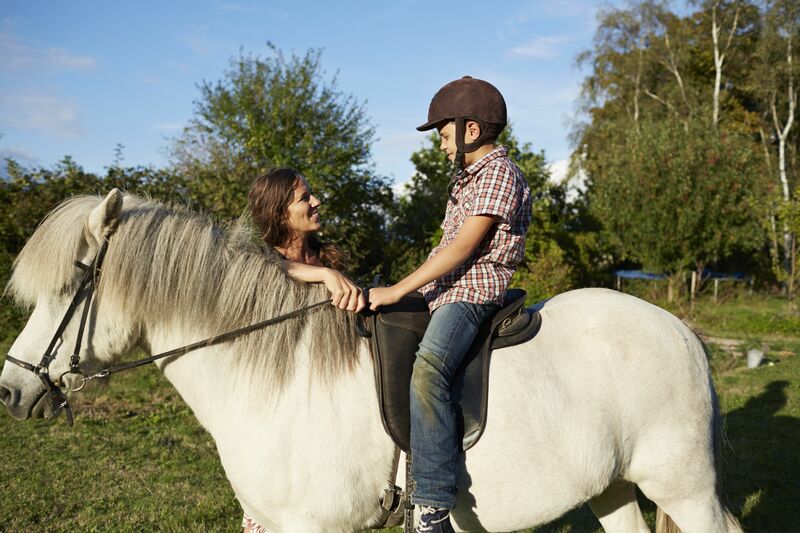 Horses that dependably, quietly, and obediently carry learning riders during lessons may be called "schoolmasters." Quite often these are older horses whose competition days are behind them, but their knowledge makes them the ideal mount for someone who wants to learn new skills. A retired schoolmaster may make the perfect first horse for a beginner. You'll most often begin riding along the rail or on the wall of the riding ring or arena. If you're in the middle, just after mounting your horse, you'll be asked to go out to the rail or wall. You may be asked to track right or left. Tracking left "on the rail" means you'll be riding counter-clockwise, and tracking right means you'll be riding on the rail in a clockwise direction. While you're riding on the rail, you may be asked to "change rein." Changing rein means to change direction. Traditionally western riders change rein by riding in a small loop towards the center line of the arena and doubling back. English riders do the opposite, however, and ride towards the center line (no further than the quarter line) and loop back towards the fence or wall. When you're asked to "change rein on the diagonal," you'll ride around the next short end of the arena, and as you ride into the long side, you'll ride a diagonal line directly to the top of the opposite corner. You'll then proceed along the short side of the arena, going in the opposite direction. If you're riding in a marked dressage arena, a change on the diagonal would be to ride F,A,K to M,C,H. If you're asked to change rein on the short diagonal, you'll ride as you did for the long diagonal, but instead of heading for the top of the opposite corner, you'll head for a point along the fence or wall that is halfway along the length of the arena. If you're riding in a marked dressage arena, a change on the short diagonal would be to ride F,A,K to B,M,C. Being "on the wrong diagonal" doesn't mean you're riding in the wrong direction! It means that as you're posting the trot, you're sitting as the horse reaches out with the outside leg, and rising when the leg hits the ground. This is opposite of what you should be doing. Learn to post the trot and remember to "rise and fall with the leg on the wall." This is probably one thing you'll hear often as you start learning to ride. It's important to keep your "heels down" while riding. Western riders probably won't hear this, but English riders may start to hear it in their sleep. "Inside leg to outside rein" means you'll be using your inside leg to push your horse's barrel towards the wall, and keeping the forward motion, while keeping the shoulders straight with contact on the outside (nearest the wall) rein. Very simply the aim is to attain straightness and flexibility. Most horses will "bulge" away from the wall or fence, and their hind quarters may not travel in exactly the same line as the front. Working inside leg to outside rein encourages the horse to work on the correct bend. When you ride on the rail or on the wall, you'll be riding on the outside track. The inside track is around the ring in the arena but about four to six feet from the wall or fence depending on the size of the riding area. "Riding the inside track" is a bit more difficult because you and the horse don't have the fence or wall to straighten you out. Exercises on the inside track help you and your horse learn straightness by forcing you to use legs, seat, and rein aids to guide your horse in a perfectly straight line, without the fence or wall as a guide. Like riding on the inside track, "riding down the quarter line or center line" is often part of exercises in straightness. Without the wall to follow, it's harder to keep your horse perfectly straight. The quarter line is halfway between the wall and center line down the long side of the arena. The center line is, of course, down the center length of the arena or ring. The quarter line is often the starting point for exercises like leg yields and half passes. It's surprisingly difficult to make the turn off the short end of the ring and not make a bulge in your line towards the wall before straightening out. You can prevent this by turning much earlier than initially feels right and looking where you're going. Or you might hear something like "open your chest." My posture is my Achilles Heel, whether on my horse on not. I've always been the "tall girl" and try to hide my height by slouching. This isn't good for my back or my horse. Slumping over means you'll be less balanced and flexible and less able to follow your horse's movements. If your horse stops suddenly, you'll already have your weight forward and could become unseated easily. Think of sitting back on your pants pockets, and stretching up as though a string were attached from the top of your helmet to the ceiling (or sky). Posture exercises off the horse are also helpful. It's hard to ride a horse with your shoulders back if you tend to walk around or sit at a desk with your shoulders rolled forward. One instructor gave me the helpful image of floating my breastbone up. This made my back feel less stiff than thrusting my shoulders back. You might also hear something like "look between the horse's ears." If the horse you're riding has a low head set, you might actually have to look down to look between its ears. But the idea is that you should keep your chin up, and look where you are going, rather than looking down at the horse, or at your hands. Looking down stiffens your spine, and you want to stay flexible.